Not too long ago (7 years to be exact), in a convenience store not too far away (in New Jersey), director Kevin Smith launched his Hollywood career with a shoestring-budgeted film called "Clerks". In addition to immortalizing the names Dante Hicks and Randal Graves in the lore of slackerdom, "Clerks" introduced the world to the dope-pushing antics of the foul-mouthed Jay (Jason Mewes) and his hetero- lifemate and man of few words Silent Bob (Smith). 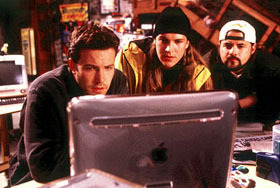 Since "Clerks", Jay and Silent Bob have become recurring characters in all of Smith's films, from dropping in to dispense sage-like advice ("Chasing Amy"), to playing a more pivotal role in the story ("Dogma")-- they have even shown up in other films, such as "Scream 3", and commercials (Mewes had a brief stint as a Nike spokesperson). Given the director's penchant for "Star Wars", these two characters have become the chatty C-3PO and the smart-yet-succint R2D2 of the 'View Askew' universe (the world in which all of Smith's films take place in). Now, with "Jay and Silent Bob Strike Back", these two iconic characters finally take the lead in their own story. Unfortunately, this mish-mash of Zucker Brothers' parody, juvenile toilet humor, and Robert Altman-style name-dropping doesn't quite work, especially for those unfamiliar with what Smith has been up to in the last few years. "Jay and Silent Bob Strike Back" kicks off with a brief prologue in the Seventies, where we learn that Jay and Silent Bob were abandoned by their respective mothers in front of a Quick Stop convenience store. Fast-forward to the present-day and they still are hanging out in front of the Quick Stop, peddling weed and making a general nuisance of themselves. However, when they learn that Miramax Films is about to start production on a "Bluntman and Chronic" movie, based on a comic book that used their likeness, the duo is galvanized into taking a road trip to Hollywood. With thousands of movie buffs on the Internet dragging 'their good names' through the mud in reaction to the news, Jay and Silent Bob reason that the best way to stop such bad mouthing is to prevent the film from being produced. Unfortunately, getting to Hollywood from Leonardo, New Jersey is much more difficult than they anticipate, especially since they lack both the requisite money and intelligence to make the trip. Even if one is a fan of Kevin Smith's films, there are two fundamental problems with "Jay and Silent Bob Strike Back". First of all, though Jay and Silent Bob have always served as comic relief in all of Smith's films (even making "Dogma" tolerable), these one-note characters are not enough to carry an entire film. In small doses, their foul-mouthed antics are amusing, but when stretched to 100 minutes, they quickly become tedious. As a result, all Smith can do with these characters is place them on a clothesline of increasingly crude and lewd situations, with little to say other than juvenile f-word-laced banter. Though "Chasing Amy" and "Clerks", by far Smith's best films, featured similar toilet humor, it was at least counterbalanced by sharp and sarcastic dialogue with an underlying point. Another problem is how much of the film relies on referential humor, both to the Smith filmography and popular culture in general. Unless one is intimately familiar with the characters and plot points of "Clerks", "Mallrats", "Chasing Amy", and "Dogma", many of the 'gee-whiz' moments in "Jay and Silent Bob Strike Back" will be lost on them, such as an opening gag where a hand-painted sign on the Quick Stop declares "I assure you we are open!" ("Clerks"), or a character insisting that 'inking' a comic book is not merely 'tracing' ("Chasing Amy"). Unfortunately, while this intertextuality is certainly interesting (at least for View Askew-geeks), it is rarely laugh-out-loud hilarious. Even the broader parody pieces, such as jabs at "Charlie's Angels", "Scooby Doo", "Good Will Hunting", "Planet of the Apes", and, of course, "Star Wars" are hardly funny-- you might crack a smile, but that's about it. 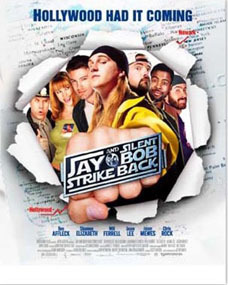 Despite the thin material, Smith seems to have been successful at attracting a veritable who's who of Hollywood to "Jay and Silent Bob Strike Back". Returning to the View Askew universe are Smith's long-time big-name collaborators, Ben Affleck ("Pearl Harbor") and Matt Damon ("The Legend of Bagger Vance"), who show up in a gag about "Good Will Hunting II", with Gus Van Sant (who recently directed "Finding Forrester") too busily counting his money to care about directing the film (Affleck also does double duty as comic book artist Holden McNeil from "Chasing Amy"). Other familiar faces include Brian O'Halloran and Jeff Anderson as Dante and Randal from "Clerks", Jason Lee playing both Banky from "Chasing Amy" and Brodie from "Mallrats", Shannen Doherty ("Mallrats") as an actress in the latest "Scream" sequel directed by Wes Craven, Joey Lauren Adams briefly reprising her role from "Chasing Amy"), comedian George Carlin ("Dogma") shows up as a hitchhiker who teaches the duo about the rules of the road, while Chris Rock plays the racist director of the "Bluntman & Chronic" movie. Non-View Askew cameos include Carrie Fisher of "Star Wars" fame as a nun, former co-star Mark Hamill playing the lightsaber-wielding villain of the movie-within-the-movie, and James Van Der Beek ("Dawson's Creek") and Jason Biggs ("American Pie 2") as the actors hired to play Jay and Silent Bob. In addition, Shannon Elizabeth ("Scary Movie 2"), Eliza Dushku ("Bring It On"), Ali Larter ("Legally Blonde"), and Jennifer Schwalbach (Smith's wife) show up as a quartet of alleged animal rights activists who have Seann William Scott ("Evolution") in tow as a cast-against-type goody-two-shoes. For those who have never heard of the View Askew universe or only have a passing knowledge of it, "Jay and Silent Bob Strike Back" will appear to be little more than a disjointed string of half-hearted gags and comic misfires, interspersed with assorted vulgarities. Even for hard-core Kevin Smith fans, "Jay and Silent Bob Strike Back" will probably be of passing interest for maintaining the continuity of the previous four films. Sadly to say, it will probably be remembered as a mediocre effort, almost as bad as his disappointing sophomore feature "Mallrats".